professionally since 1989. He had the opportunity to pursue his love of visual art at Carnegie-Mellon University and Vermont College of Fine Art. 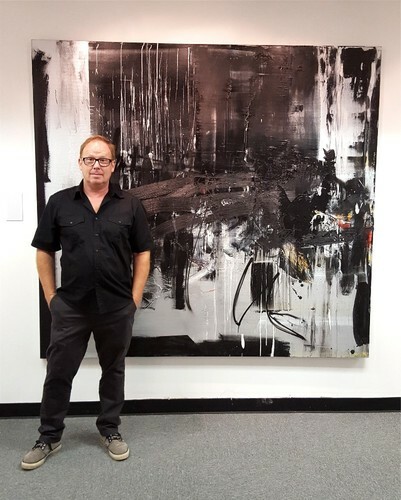 He has also mentored with DC artist Sam Gilliam and NYC artist, writer Mira Schor. In 1990 David French presented his first solo exhibit in Chicago. David continues to show his work in museums and galleries across the country. Recently, David participated in A Dark Wood at Art House Production and Curious Matter in Jersey City NJ. He recently received a purchase award from the Noyes Museum, to install a public sculpture on view at The Atlantic City Waterfront Sculpture Walk. In 2013 he had a solo exhibit of paintings and works on paper at the Rawls Museum in VA. He has also exhibited at SOHO'20Gallery and G.R.N’Namdi Galleries in New York. David had favorable reviews in the Baltimore Sun, The Baltimore Examiner, The Chicago Tribune and Greater Media News. He is represented in the collection of the University of Pittsburgh, the Pittsburgh Consolidated Gas Co., Cincinnati Bell Information Systems and CertusBank among many private and corporate collections.